Recharge your Sony Mirrorless with this bag? In this video I am showing you a recent bag I have gotten, which I really like using, its small but still can pack quite a lot of gear in it for its size. 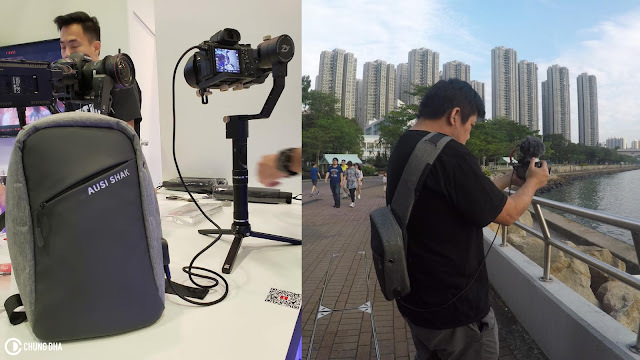 But the most important part of this bag is its USB port which I can connect to my phone or to my Sony A7rii, this is really great when I am using the Sony A7rii for capturing an event or just for daily vlogging, enabling longer use of the camera without the need of swapping the batteries as it can recharge the battery inside the camera. Also the design of this bag looks less like that I am traveling with a camera, as it does not look like a camera bag and anything could be in it. Also I have tried having my camera mounted on a gimbal with the USB cable connected and it works brilliant and does not block any of the movements and give also a much longer use of my camera while working with a gimbal, as swapping batteries with a gimbal is often quite a hassle to do and often its the camera that runs out of battery, while most gimbals have a quite long battery life.